No matter how careful you are, towels tend to get stained. Gray stains can result from foods, dirt, bleeding from clothing, hard water, or even the interior of your washing machine. If your towels are stained, you can remove these unsightly gray marks using a variety of household cleaning products. Put the stained towel into your washing machine and fill with hot water. 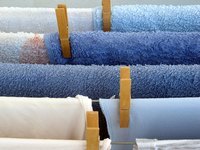 Towels are made of heat-safe materials so hot water should not affect the fabric. Pour 1 tbsp of vinegar into the hot water and set the machine to the "Rinse" cycle. Allow the towel to process. Remove the towel and examine the stain. In many cases, hard water causes gray stains so the vinegar will help to neutralize the water and lift the stain. If the stain is still present, continue to Step 4. Soak the affected area of the towel in oxygenated detergent. Rub the gray area gently to work the detergent into the fibers of the towel. Oxygenated detergents work to break apart stains and lift them from the fabric. Allow the detergent to remain on the towel for 30 minutes, then place the towel into your washing machine. Fill the washing machine with hot water. Once full, add 1/2 cup bleach if the towel is white or 1/2 cup color-safe bleach if the towel is any color other than white. Add the bleach to the water and avoid pouring it directly onto the towel. Start the washer on the "Wash" cycle and allow the towel to complete the cycle. Remove the towel and allow to air-dry. If you have hard water, consider installing a water softener. Water softeners remove the minerals in you water which may be causing gray stains on your clothing.